Charming cottage remodeled & newly furnished. Fireplaces in living room and Master bedroom. Master bedroom has a king bed, 2nd bedroom has full & twin and 3rd bedroom has 2 twins. There are 2 1/2 bathrooms- master bath, upstairs hall bath ( tub & showers in each) and 1/2 guest bath down. Full dining room. Lg. newly equipped kitchen with eating area and dining bar. Small den off kitchen. Washer & dryer, all linens supplied, hot water baseboard heat. Prime location on sunny east side of the world's most beautiful lake. Enjoy sunsets with your wine from our upper deck or new front flagstone patio. 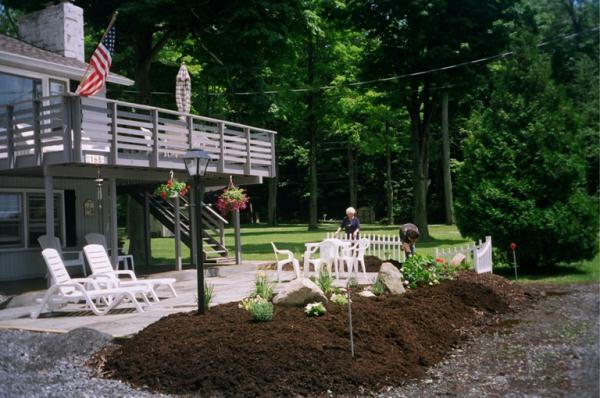 Cottage shares ( with only 4 others) level lakefront with dock . Truly a very special spot to vacation with easy (7 min.) access to all the Village has to offer. Security deposit required. No smoking or pets please. $2500.00 July & August. Taking reservations now for summer of 2019. For further information email: rwack2@aol.com or call Charliene Wackerbarth at (541) 389-2020 - Oregon. CELL PHONE:541-280-1135. 1 Cabin/Cottage: 3 bedrooms $2200/wk.